Representative Honours: Ireland: 1 Full Cap (1950); Eire: 16 Full Caps / 3 Goals (1949-1955); Football League Division Three North representative (1955). Club Honours: (with West Brom) Football League Division One Runner-Up 1953/54; Football League Division Two Runner-Up (promoted) 1948/49; FA Cup Winner 1953/54; FA Charity Shield Shared 1954; (with Derby) Football League Division Three (North) Champion 1956/57; (with Coventry) Football League Division Four Runners-Up (promoted) 1958/59. Dual international wing-half Paddy Ryan remains one of the most revered names in the history of West Bromwich Albion. Having played Gaelic football for the Marino School in Dublin whilst growing up, Ryan took to soccer after moving to Blackpool in the early years of the Second World War. He played with Claremount School before earning selection for Blackpool Boys and earned trials with Sheffield United and Nottingham Forest. 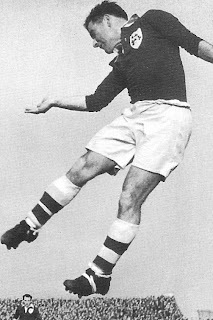 After playing works-football and War-Time non-League with Nuneaton Borough, Ryan was offered amateur terms by Coventry City in April 1943, signing professional in August 1944. In April 1945 Ryan arrived at the Hawthorns to sign for West Brom. 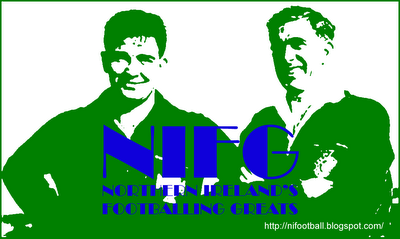 He made his Baggies debut in the transitional Football League South against Millwall in November 1945. Described as stocky but mobile, it took time for him to make his mark (he didn't make his League-proper debut until April 1947) but when given regular run-outs he put in remarkably consistent and impressive performances from either wing-half position or at inside-forward. A bit-part player in West Brom’s 1948/49 promotion campaign, Ryan came to relish First Division football. By the end of his first topflight campaign he had been awarded caps by both the FAI and the IFA. 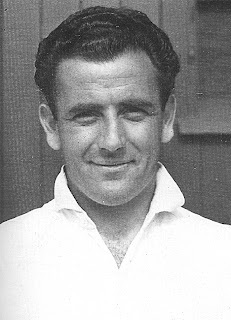 His debut for Eire came in a 3-1 World Cup Qualification defeat by Sweden at Dalymount Park and his debut for the Belfast-based association came as left-half against Wales in March 1950 on the last occasion on which southern-born players were selected (he was joined on the field by fellow southerners Con Martin, Davy Walsh and Bud Aherne). Ryan remained a regular for Eire for six seasons, his versatility used to great effect. On the domestic front Ryan was the hub of West Brom’s engine room as the club went close to a League and Cup Double. Although they had to make do with just the FA Cup, defeating Preston 3-2 in the Wembley final, as they finished four points behind local-rivals Wolves in the race for the League title. Still, the following season opened with an exhilarating Charity Shield clash with Wolves which ended in a 4-4 draw with Ryan on the scoresheet. Nicknamed “Rubberneck” due to his prodigious heading ability, Ryan was not much of a goal-getter, but more of a goal creator. When employed as a forward he played in, what would now be described as, “the hole” behind the main strikers, linking defence to attack. When he did score they were often spectacular, rasping drives against Manchester United and Blackpool among his best. In 1955 Ryan left West Brom for Derby County in a £3,000 deal. He was seen as the man to instill some spirit into the Rams who had reached the lowest point in their history. They just missed out on promotion to Division Two in 1956 but in 1957 Ryan captained them to the Division Three (North) title. With Derby Ryan also found a rich vein of goalscoring form, finishing as the club’s topscorer in their return to Division Two in 1957/58. During his time with Derby Ryan also represented Division Three (North) against their southern counterparts. Ryan finished his long career back at Coventry, then a club in despair. Immediately appointed captain, he led the team from the bottom half when he joined to promotion from Division Four in 1959. His experience, ability and attitude rubbed off on those around him as City maintained their Division Three status. He retired from playing in November 1960, but remained with the club as pools organiser until 1961. He then took a similar position back at West Brom where he later became chief scout from September 1962 to October 1976. He remained an active scout for Aston Villa, Derby, Hereford United and Leeds United until 1994, just three years before his death. Summary: 16/3. Won 5, Drew 3, Lost 8.